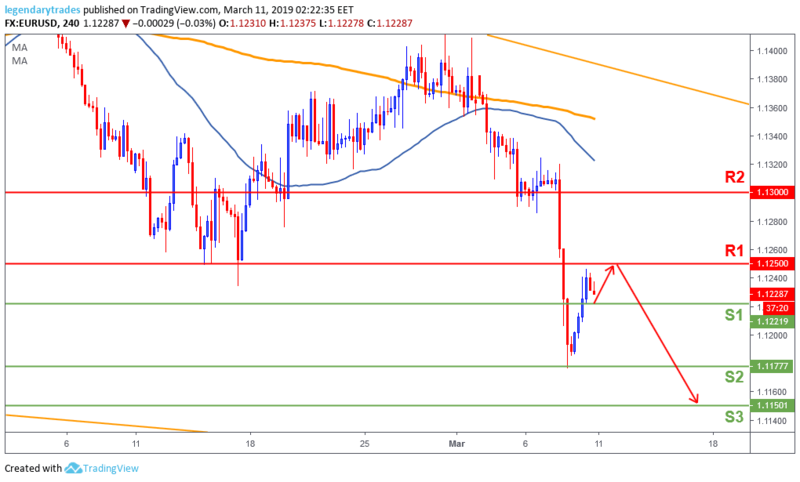 The Euro recovered during Friday’s session, after mixed US employment data showing only 30K jobs being created in February vs 181K, in contrast the Unemployment rate fell to 3.8% vs the anticipated 3.9%, while wages increased more than expectations. Additionally, Building Permits beat expectations by 1.4% offsetting the negative 2.9%. However, the single currency closed the week in the red as the market sentiment remains negative following the dovish announcement from the ECB on Thursday. Today, German Industrial Production and Trade Balance figures will be released, but traders will most likely focus on the US Retail Sales which will be released during the US trading session. The Euro bulls retook control on Friday and closed the price above 1.12. But overall, the long-term trend remains bearish as long as price is below 1.1250 (R1). Should we break the key support at 1.1220 (S1), we expect selling to accelerate to yearly lows at 1.1177 (S2) and 1.11501 in extension.